After leaving Chan Chun Fook and Cheah Pak, Luk Ah Choy was thinking of his sifu, the Venerable Chee Seen. He sifu had been like a stern father and a kind mother to him. He was sent by his sifu to catch Lai Fu, who secretly crawled through a drainage hole of the Shaolin Monastery instead of graduating through the Lane of Wooden Men. Now he let Lai Fu go. Didn’t he forget his sifu’s grace and forsake his sifu’s righteousness? Didn’t he betray his sifu? He became very miserable, and decided to return to the Shaolin Monastery at once to see his sifu. As soon as he arrived at the Shaolin Monastery, he went straight to a meditation room to see his sifu, the Venerable Chee Seen. He knelt down and said nothing. Hearing this, Chee Seen was furious. “Bring my Zen maze!” he ordered. The monks nearby were terrified. Those sympathetic to Luk Ah Choy were perturbed, thinking in their heart that Luk Ah Choy would surely be seriously punished. Some eyed Luk Ah Choy and were worried for him, but Luk Ah Choy was unmoved. He continued kneeling without saying anything. Two monks brought his Zen mace for Chee Seen. He took the mace and walked out of the room. After a few steps, he turned round and asked Luk Ah Choy to follow him. He also asked the monks standing on both sides to sound the monastery bell. When the monastery bell was sounded, everyone assembled in the main hall. The atmosphere was very tensed. Everyone was aghast to the extreme. Chee Seen, with the Zen mace in his hand, stepped forward. He asked Luk Ah Choy to stand in front of the gathering. “Ah Choy,” Chee Seen said loudly, “you have never beguiled the blood in my heart (i.e. my earnest dedication and expectation). The Venerable Chee Seen continued, “The principles of our monastery are to be wise, compassionate, courageous and trustworthy. You have achieved all these principles. Today, I have gathered everybody to show you as a model, so that all who come after can be like you. “Let us just discuss what you have done this time. You received order to bring Lai Fu back to the monastery. Other people will do just that, so as to please me. But you are different, you let him go. You let him go because you do not want to see someone whom you have met for years to fight amongst themselves. Anyone who lacks feelings and righteousness cannot do that. “Anyone knows that disobeying sifu’s order would be severely punished. But you are willing to take the punishment on his behalf, showing the great compassion of your heart. To be able to do this requires wisdom and thoughtfulness. It is not attainable by ordinary people. “You have waited till today to return to the monastery to report. You have spoken straight (i.e. honestly) without any lies. This is trustworthiness. “Just now I shouted for my Zen mace. For other people, whose face will not change color, whose legs will not shake? But you have remained complacent, and your spirit was calm. Without courage, who can do this? After he had completed his speech, the Venerable Chee Seen held a cup of tea and passed it to Luk Ah Choy. Luk Ah Choy again prostrated, then drank the tea in one gulp. After Luk Ah Choy had finished drinking the tea, the Venerable Chee Seen said. Luk Ah Choy was one of the Shaolin masters who spread Southern Shaolin Kungfu to the world. His disciple, Wong Kai Ying, taught his son, Wong Fei Hoong, whose lineage spread to Europe and North America. This entry was posted in Grandmaster Wong Kiew Kit, Kung Fu, kung fu culture, legends, Shaolin, Shaolin Temple, Shaolin Wahnam, showing respect, stories, Ten Shaolin Laws and tagged Grandmaster Wong Kiew Kit, Kung Fu, kung fu culture, legends, Shaolin, shaolin temple, Shaolin Wahnam, showing respect, Stories, Ten Shaolin Laws on September 25, 2018 by Wei Joo Lee. Luk Ah Choy, the old man who was the owner of the shop, and Cheah Pak were drinking wine, enjoying delicious dishes and conversing like old friends. They talked about heaven and earth (i.e. talked about causal things) until late at night, until most of other people were asleep. Luk Ah Choy learned that the old owner was called Chan Chun Fook. “That’s a lovely pipe, Uncle Fook” Luk Ah Choy commented, pointing to the pipe the old owner was smoking with. They were dining inside the shop, but suddenly a group of about ten persons in black dresses and all wearing masks appeared. They jumped in from open windows and were carrying weapons, like sabres and staffs. “We’re here to take your money,” the leader who was holding a pair of sabres in his hands, said loudly to the dinners in the shop. “Quickly place on the table all you have, or else we shall chop you into pieces.” His voice was like thunder. A few remaining customers who were still having their meals were terrified. Luk Ah Choy reached for his iron drakes and ducks, secret weapons he carried in a small bag on his body. In an instant, he sent the flying iron pills at the robbers. He had learned the secret weapons from a master, so his aim was very accurate. He hit the hands of the robbers holding their weapons. Their weapons dropped on the floor, and they were holding their hands in pain. Some of them were groaning on the ground. But the leader used his two sabres to deflect the flying iron pills. He was shocked to see all his remaining gang members wounded. For a few seconds he did not know what to say. Cheah Pak and Ma Hoi Sing chose a space near the door with no tables around. They each adopted a poise pattern. Cheah Pak stood at a lift-stance with his arms apart, in a pattern called “Beggar Asking for Food.” It looked open and inviting, but a skillful martial artist could respond effectively when an opponent attacked. 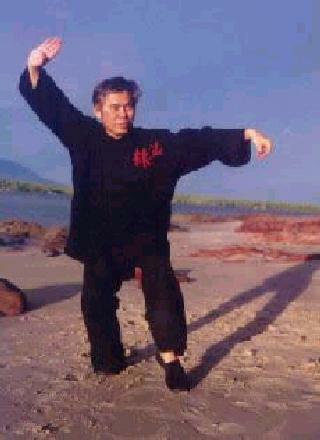 Ma Hoi Sing stood in a left bow-arrow stance with his left hand in front of his right hand, guarding his body. 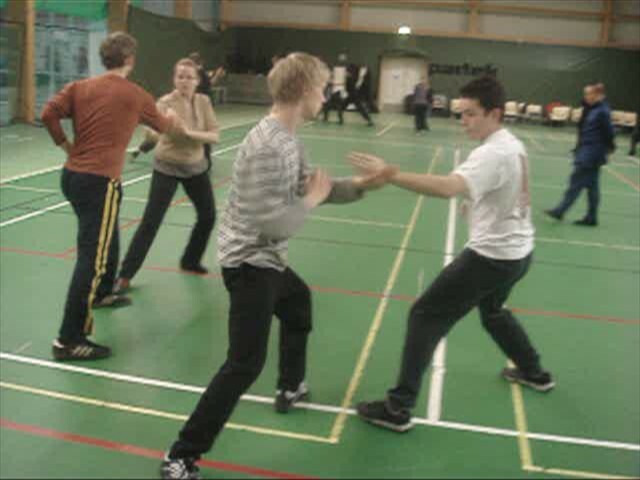 This was a common pattern used by northern style martial artists. True enough as northern kungfu styles were known for their agility, Ma Hoi Sing moved in swiftly with a right punch in a right bow-arrow stance. Cheah Pak retreated his front right leg, warded off the thrust punch with his left hand, moved his left leg forward in a bow-arrow stance and struck out his right fist, in a pattern known as “Black Tiger Steals Heart”. His punch was full of power. 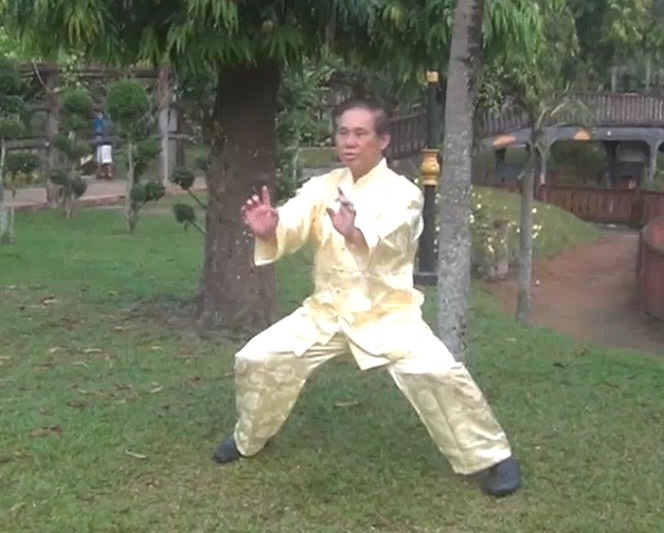 Ma Hoi Sing pulled back his right bow-arrow stance into a right lift-leg stance, still with his right leg in front but avoided the full force of Cheah Pak’s punch. Simultaneously he changed his right punch into a hook-hand by holding his five fingers together like a crane-beak, and hooked away the punch. Immediately be moved forward his right leg into a bow-arrow stance, and struck the opponent’s face with his left palm. The two combatants exchanged many encounters. For a time it was uncertain who would be the winner. From a side by observing Ma Hoi Sing’s movements, Luk Ah Choy was quite certain that he was a northern kungfu exponent, especially when he used a pair of sabres. A southern kungfu exponent would only use one sabre. After many exchanges, Ma Hoi Sing used his left palm to strike at Cheah Pak’s face. Cheah Pak warded off with his left hand. Immediately Ma Hoi Sing struck the opponent’s face with his right palm. Cheah Pak warded off the attack with his right hand. But the two palm strikes were feign moves to distract the opponent. Instantly Ma Hoi Sing opened Cheah Pak’s defending hands, and kicked up his right leg at Cheah Pak’s chest, so fast that Cheah Pak could not avoid, and fell back a few feet. He hit an empty chair, then fell to the floor. Ma Hoi Sing attained his intention that he forgot his appearance (i.e. he was glad he attained his intention of defeating Cheah Pak that his conduct and appearance became bizarre). He turned round to look at Luk Ah Choy. “Just now your secret weapons disarmed by brothers, though I could deflect them. Using secret weapons is not honorable,” he said. “Coming in with masks and in black dresses to rob is also not honorable,” Luk Ah Choy replied. “As you have asked, I shall oblige,” answered Luk Ah Choy. This entry was posted in Grandmaster Wong Kiew Kit, Kung Fu, kung fu culture, Kung Fu Sets, kung fu sparring, legends, Shaolin, Shaolin Temple, Shaolin Wahnam, stories and tagged Grandmaster Wong Kiew Kit, Kung Fu, kung fu culture, Kung Fu Sets, kung fu sparring, legends, Shaolin, shaolin temple, Shaolin Wahnam, Stories on September 11, 2018 by Wei Joo Lee. One day a Shaolin student called Lai Fu wanted to fight his way through the Lane of Wooden Men. But after a short while, Lai Fu was screaming in the chamber. He was badly hurt by the Wooden Men. The Venerable Chee Seen ordered the operation mechanism of the Wooden Men be turned off, and Lai Fu to be carried out. After applying medicine on him, and resting for a few days, Lai Fu felt better. But he was depressed. He had been learning kungfu in the Shaolin Monastery for more than ten years, but now he could not pass through the Wooden Men. Anyone who could not graduate from the Lane of Wooden Men had to remain in the monastery, no matter for how long he had been there. Lai Fu realized that earlier Wu Wei Thein was in the same situation. Wu Wei Thien could not fight his way through the Wooden Men, and had to crawl out of the monastery through a drainage hole. But since that time, an iron grill was made to cover the hole. Water could flow through the grill, but it prevented any human from crawling through it. Lai Fu thought hard and found a solution. Every day, without other people knowing, he took some vinegar from the kitchen and pour the vinegar at the iron grill. After repeating the action for a month, the vinegar ate into the iron making the iron grill fragile. One late, after he had made sure everyone else was sleeping soundly, he went quietly to the drainage hole. He bent down so that he would not be noticeable and used an iron staff to hit hard at the iron grill. After some hitting, the iron grill collapsed and he crawled through the drainage hole. Outside the monastery wall, he knelt down, knocked his head three times on the ground, and then hurried down the mountain. Early next morning, some monks on duty discovered that the iron grill at the drainage hole was broken. They quickly sounded the monastery bell to alert all those in the monastery. All the monks and students of the Shaolin Monastery gathered at the main hall. Chee Seen called the register and found that Lai Fu was missing. Chee Seen was very angry. “Where is Luk Ah Choy?” he shouted. Luk Ah Choy left the Shaolin Monastery, He searched in the day time and slept at night, ate when hungry and drank when thirsty. After a few days he came to a small town. He found an eating shop at a main street. He could smell the aroma of rice, and felt he was hungry. So he entered the shop and looked around to find a table to have his meal. To his utter surprise, he found a familiar face sitting at a corner. He was Lai Fu, the man he had been searching for many days. Lai Fu was shocked. He asked his siheng (or elder kungfu brother) to sit down. “I am under the order of our sifu to bring you back to the Shaolin Monastery,” Luk Ah Choy went straight to his mission. “Luk Siheng,” Lai Fu pleaded, “Please don’t come forward.” He quickly grasped his iron staff which was leaning against a wall. Lai Fu replied, “Siheng Wu’s escape was due to his filial heart. Isn’t my escape due to my filial heart too?” I also have a father and a mother. I have entered the Shaolin Monastery for ten years. Because I am stupid, my kungfu progress is not great, I cannot pass through the Lane of Wooden Men. As if I am stupid, I cannot see my father and mother? “Siheng, you were also born from your father and your mother. Being a son or daughter, who does not think of his or her own father and mother? Moreover, I have been in the monastery for ten years. This time my escape was due to the binding of bitterness of thinking of my father and mother. Thus I used such a mean method. It was not because I purposely wanted to break monastery rules. Saying this, his eyes were filled with tears, and he swallowed his voice. Luk Ah Choy also dropped his head without his own knowing. He thought silently to himself, “His secret escape is also due to his feeling for his father and mother. This feeling was human in all heaven and earth. He himself did not have any trace of being tied or dependent on any support because he had lost his parents when small. Otherwise, he would not be able to release himself from such emotion. Moreover, this time descending the mountain to catch Lai Fu was he alone. If he let Lai Fu go, no one would know. When his heart was moved, his hands became soft. He signed and said, “According to reasons, an order from sifu cannot be avoided. But thinking that your action came from your filial heart, I’ll let you go to reverence your father and mother. Lai Fu was touched until his tears and mucus flowed out profusely. Quickly he knelt down to thank Luk Ah Choy. Lai Fu grasped his iron staff, ran out of the shop, and fled like a comet. This entry was posted in filial piety, Grandmaster Wong Kiew Kit, Kung Fu, kung fu culture, legends, Shaolin, Shaolin Temple, Shaolin Wahnam, stories and tagged filial piety, Grandmaster Wong Kiew Kit, Kung Fu, kung fu culture, legends, Shaolin, shaolin temple, Shaolin Wahnam, Stories on August 21, 2018 by Wei Joo Lee. Luh Ah Choy was very happy. He prostrated to his sifu, the Venerable Chee Seen, and early next morning he went to the Lane of Wooden Men. The mechanism of the one hundred and eight Wooden Men was set in operation. These wooden men were so ingeniously devised that they fought with good kungfu techniques and skills. But Luk Ah Choy’s kungfu was excellent. He avoided some wooden men, fell some, pushed away some, jumped over the heads of a few, and fought his way through the lane. At the exit, he found a large copper urn with three joss sticks burning. The large copper urn barred the way of the doorway. To exit, Luk Ah Choy had to lift the urn, turned his body around, and then exited with his back. Two marks, a dragon on his left arm and a tiger on his right arm, were imprinted on his two arms as marks of one who had successfully fought his way through the Lane of Wooden Men in Shaolin Monastery. The Venerable Chee Seen was very pleased. “He has not forsaken my bitter heart (i.e. my long time and earnest effort in teaching him),” he said to himself. Chee Seen returned to his meditation room and sat down to rest. Then, Luk Ah Choy hurriedly came back. Soon, deep autumn arrived. The scenery of the mountain became cool and fragile, the solitary monastery was deep and recurring, a role of chrysanthemum flowers swayed in the breeze, and myriad dew drops were found on wild grasses. Luk Ah Choy was taking a stroll in the back garden, and heard sounds of strange creatures in the distance, and found red leaves floating in the air, creating in his heart a sense of peace and tranquility. Suddenly he heard something clear and distinct, like something hitting a wooden floor. Luk Ah Choy was curious, followed the clear and distinct sound, and hid himself behind an old tree. He saw a monk practicing kungfu. The monk placed a wooden board, with a target on it, tens of steps before him. He waved his hands and countless iron pebbles hit the target. This entry was posted in Grandmaster Wong Kiew Kit, Kung Fu, kung fu culture, Kung Fu Weapons, legends, Shaolin, Shaolin Temple, Shaolin Wahnam, stories and tagged Grandmaster Wong Kiew Kit, Kung Fu, kung fu culture, kung fu weapons, legends, Shaolin, shaolin temple, Shaolin Wahnam, Stories, Weapons on August 7, 2018 by Wei Joo Lee. The Venerable Chee Seen asked Luk Ah Choy to stand firmly at his stance, then with his dragon-form fingers (formed by bending the thumb, the fourth finger and the small finger, and letting the index finger and middle finger pointing forward) gently dotted at an energy point called “yun men” (at the joint where the arm joined the shoulder). Luk Ah Choy felt his body numb and was thrown back a few feet. Chee Seen sat on a mat in a lotus poise, and said, “Buddhism is very deep. At its shallow levels, there are explanations on various topics. At its deep levels, it is difficult to explain. 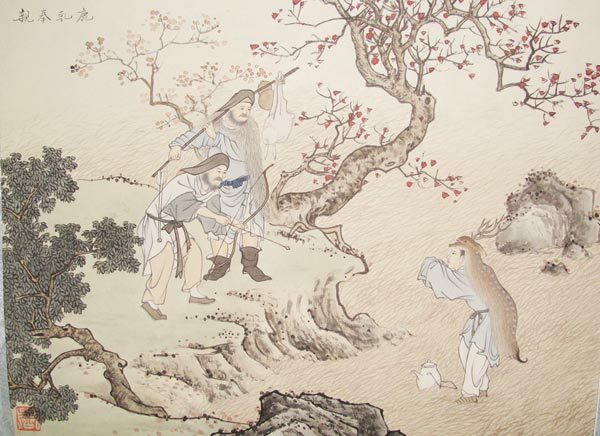 Our patriarch, Bodhidharma, transmitted the art knowledge and the art without words. He pointed directly at the heart (which means ‘mind’ in English, and is different from brain). “Seeing Nature (i.e. 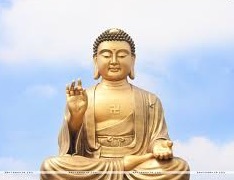 transcendental Cosmic Reality, often called God in Western culture), one becomes Buddha (i.e. merges with transcendental Cosmic Reality without any differentiation). This is Chan (or Zen). “Chan values silent understanding, and cherishes liberation (i.e. the personal soul is liberated to meet the Universal Soul). The art is entering silence (called “meditation” in Western languages), with direct experience as the spiritual gate (i.e. in his training, one has to directly experience its result). “Only then, can you say you are enlightened. Thus, your nature must be quiet, and your heart empty (i.e. to experience transcendental Cosmic Reality, you must be quiet, and you must not have any thoughts), be liberated from all worries, and overcome the hurdles of life and death. For a time Luk Ah Choy understood, for a time he did not. He remained kneeling on the floor, dazed and bewildered. These words were like morning bells and evening drums (i.e. words of enlightenment, as bells and drums were sounded in temples in the morning and the evening to enlighten people). The heart cavity (i.e. the mind and understanding) of Luk Ah Choy opened and became clear. Again he knelt and thanked the Venerable Chee Seen three times. Since then, Luk Ah Choy increased his diligence and benefits. Within two years, he gradually understood the three tastes of internal art (i.e. all of internal art). He practiced well the genuine techniques of Shaolin, like dragon traveling, bear claws, eagle eyes, monkey paws, crane steps, snake movement, bird jumping, cat dodging, dog avoiding, leopard fists, rabbit running, lion catching, and tiger charging. Whether it was long fist or short strike, attacking or defending, moving forward or retreating, there was nothing that his heart reached essence and ultimate attainment (i.e. he did them excellently). This entry was posted in Buddhism, Grandmaster Wong Kiew Kit, Kung Fu, kung fu culture, legends, Shaolin, Shaolin Temple, Shaolin Wahnam, spiritual cultivation, stories and tagged Buddhism, Grandmaster Wong Kiew Kit, Kung Fu, kung fu culture, legends, Shaolin, shaolin temple, Shaolin Wahnam, spiritual cultivation, spirituality, Stories on July 31, 2018 by Wei Joo Lee. Luk Ah Choy knew that the Venerable Chee Seen was a top master of kungfu. Many people wanted to learn from him, but were unsuccessful. Luk Ah Choy went about in search of Chee Seen. He saw a temple with the sign showing “Six-Birth Monastery”. He went forward and was met by a monk on duty. Luk Ah Choy had been to many monasteries, like “Glorious Filial Monastery”, “Beautiful Forst Monastery”, and “Big Buddha Monastery”, but could not find the Venerable Chee Seen. Some said that he was at the Elixir-Mist Mountain, and some said he had returned to Fujian Province to rebuild the Shaolin Monastery. But Luk Ah Choy did not give up. He continued to search, and had walked all over the two provinces of Guangdong and Fujian. One day Luk Ah Choy came to a deserted mountain. All around there was no individuals and no smoke (i.e. no families whose houses gave out smoke from their chimneys). There was only a clump of black forest. He wanted to climb higher to release the hindrance in his heart. So he used his art of lightness and ran up the summit. He saw a temple wall, and at the entrance were written “Shaolin Monastery”. He was shock. He knew that there were two monasteries called “Shaolin Monastery”, one in the north on Song Mountain in Henan and the other in the south in Potian in Fujian Province. He never knew that on this wild mountain there was another Shaolin Monastery. The monk led him through the main hall, and went to the east meditation hall, where they found an elderly monk writing on a table. This monk was tall, glowing in the face, his eye brows were elegant like a mountain stream, his chest contained the mechanism of heaven and earth, his eyes like comets, and his radiance shot at others. Luk Ah Choy knew this must be the Venerable Chee Seen. So he knelt down and presented the jade pendant. Luk Ah Choy answered, “Student Luk Ah Choy prostrate to the great Venerable Spiritual Teacher.” He took out the recommendation letter from Li Chooi Peng. The Venerable Chee Seen nodded his head, and said, “Then, you can remain in the monastery.” He continued his writing. Luk Ah Choy did not dare to say further. He withdrew himself. Hence, Luk Ah Choy remained in the monastery. He helped in the kitchen to cook, he fetched water or chopped firewood, or he swept the monastery to keep it clean. He was diligent. But Chee Seen seemed to have forgotten such a person existed. Not only he did not teach Luk Ah Choy any kungfu, he did not ask about him at all. A month soon passed. Luk Ah Choy did not mind at all. Although Chee Seen did not teach him anything new, every night he would secretly practice what he had learned before. One night he passed Chee Seen’s sleeping room. He noticed that a light shone through a narrow gap in the door, and from inside was heard striking with hands and kicking with legs. Luk Ah Choy was curious. Secretly he went to the narrow gap to have a peep. He was shock at what he saw. Chee Seen was practicing kungfu in his room. It was different from what Luk Ah Choy had seen before all his life. He did not want to leave. So every night he stole to have a peep at the narrow gap of Chee Seen’s door. Chee Seen’s movements and techniques were impressed in his mind. He diligently practiced the movements and techniques, and his kungfu progressed tremendously. Actually Chee Seen knew that Luk Ah Choy peeped at the door every night, but Chee Seen did not reveal it. He wanted to test Luk Ah Choy’s appreciation of Zen. For many months, he observed Luk Ah Choy, and found him full of energy and rich in spirit, his body was healthy and strong, and knew that Luk Ah Choy was wise, capable attaining what most people could not attain. One day, Chee Seen asked Luk Ah Choy to see him, and asked Luk Ah Choy to demonstrate a kungfu set. Luk Ah Choy was very happy. He showed what he had been secretly viewing. Luk Ah Choy was happy like being mad. He prostrated before his sifu. Under the guidance of Chee Seen, he ‘manifested courage and forgot his food’ (i.e. he showed courage in his learning , and was so diligent that he sometimes forgot about his meals), and often discussed and practiced with other monks in the monastery, that ‘benefited in essence and aimed at essence’ (i.e. he was already excellent as he knew the essence, but he aimed to be even better to know more essence). In about half a year, his martial art progressed tremendously. This entry was posted in Grandmaster Wong Kiew Kit, Kung Fu, kung fu culture, legends, Shaolin, Shaolin Temple, Shaolin Wahnam, stories and tagged Grandmaster Wong Kiew Kit, Kung Fu, kung fu culture, legends, Shaolin, shaolin temple, Shaolin Wahnam, Stories on July 24, 2018 by Wei Joo Lee. Luk Ah Choy packed his belongings, bade his sifu good-bye and descended the mountain. The evening sun was sinking in the west, and yellow leaves covered the whole mountain, fresh wind blew gently, creating a beautiful scene. At night Luk Ah Choy travelled fast, covering more than a hundred miles. Early next morning he arrived at a small town and went into a small eating place. Entered two persons, a fat one with fair skin and the other thin like a monkey. The two of them sat near a window. They ordered two katis of beef, half a katy of pork, a whole roast goose, a barrel of white rice and two huge jars of wine. Luk Ah Choy was very surprised. These two persons were not “rice barrels” (i.e. one who ate a lot of rice), how could they contain so much material. But these two persons were like “tigers devouring and wolves swallowing” (i.e. eat heartily and hungrily), like wild breeze sweeping fallen leaves, and ate all. Luk Ah Choy heard that fat people might eat many times that of ordinary people, but he had not seen thin people have such appetite. After eating, they left some money on the table, without waiting for chances. Then swaying freely, they left the eating place. Luk Ah Choy followed them. Sometimes they talked softly, sometimes they laughed loudly. Their moements were extraordinary, and their behavior was unlike ordinary people. Soon they reached the front of an ancient temple. There were two stone lions in front. The two persons sat on the stone steps of the temple to enjoy some cooling breeze. Luk Ah Choy was listening behind some bushes. Hearing this, his eyes became bigger and rounder. “Too heavy, too heavy,” he shook his head. He approached the stone lion. Then he adopted a Horse-Riding Stance, and place his right hand beneath the stomach of the stone lion, and his left hand at a leg. Giving a shout, “Up”, the stone lion was lifted up above his head. He walked a few steps and then replaced the stone lion at its original place. “Who?” the two persons turned their head and asked. The fat person refused to let Luk Ah Choy leave. Luk Ah Choy had no choice, and said, “Please teach me”. Then he demonstrated a kungfu set. The two persons laughed out loudly. The fat person said, “In the midst of wind and dust (i.e. in the phenomenal everyday world), we haven’t thought we could meet someone from the same root. This is due to the good karma of our previous lives (i.e. we must have done something good in our previous lives). He took out a small jade pendant and gave it to Luk Ah Choy. The fat person said, “I’m called Sap Kit (“Sap Kit” is in Cantonese pronunciation. In Mandarin pronunciation it is called “Si Jie”. The written words are the same.” “Sap Kit” means “Ten Genius”. (The two persons called themselves “Sap Kit” because they were two of the ten best disciples of the Venerable Chee Seen, the First Partriarch of Southern Shaolin Kungfu. Their actual names were Thong Chein Kern and Lai Pak Fu. The other eight geniuses or best disciples were Wen Leong Yuk, Hoong Hei Khoon, Luk Ah Choy, Fong Sai Yuk, Li Chooi Peng, Fong Mei Yuk, Fong How Yuk, and Wu Wei Thien. Other sources listed the ten great disciples of the Venerable Chee Seen as the Venerable Harng Yein, the Venerable Sam Tuck, Hoong Hei Khoon, Lin Swee Heng, Luk Ah Choy, Thong Chein Kern, Miu Chooi Fa, Fong Sai Yuk, Li Chooi Peng, and Ma Ling Ye. Without saying another word, the thin and the fat persons walked away, without even turning their head. Luk Ah Choy just watched their backs and realized they were very odd. How could they both be Sap Kit. Obviously it was not their actual names. He realized that all great people outside the world (i.e. extraordinary people) were odd. Luk Ah Choy searched for about a month according to the address given by the fat person, and finally found a house in a small village outside the city of Guangzhou. The house was humble, and an old woman was outside the house knitting some clothing. The old woman was surprised. “Yes,” she answered. Inside the house somebody answered in a young girl’s voice. Luk Ah Choy was surprised. Then he realized. Li Chooi Peng was a young girl. No wonder the old woman looked at him with strange eyes just now. Luk Ah Choy conveyed his greeting. Then he presented the jade pendant and explained what had happened in front of the old temple. Li Chooi Peng just nodded her head, and she felt satisfied. She invited Luk Ah Choy to enter her house and asked him a number of questions, like where he came from, and how long he had practiced kungfu. Luk Ah Choy answered truthfully. 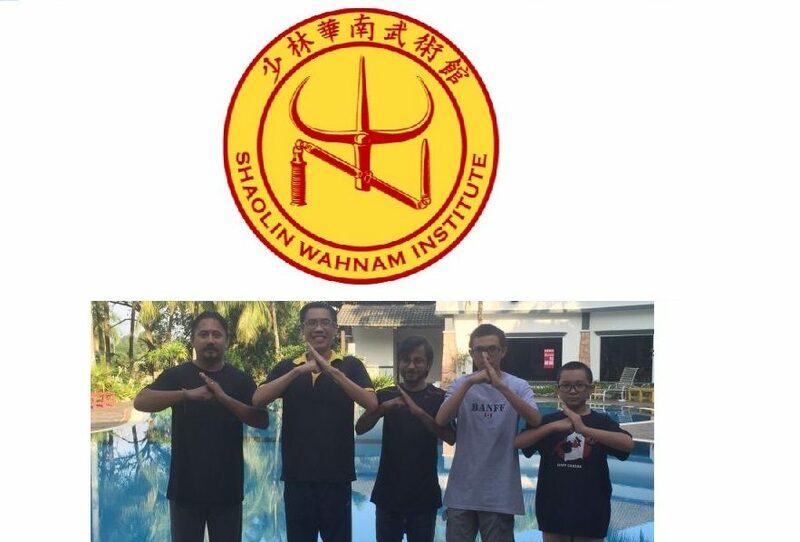 This entry was posted in Grandmaster Wong Kiew Kit, Kung Fu, kung fu culture, legends, Shaolin, Shaolin Temple, Shaolin Wahnam, stories and tagged Grandmaster Wong Kiew Kit, Kung Fu, kung fu culture, legends, Shaolin, shaolin temple, Shaolin Wahnam, Stories on July 17, 2018 by Wei Joo Lee.